The Next Big Thing in Wedding Video Songs! Choosing the right wedding video songs is important to ensure that you have a video that's worth watching. The music should fit into the moment and enhance the emotions captured on video. What better than our Bollywood, pop and Indian folks songs to take cue from to add magic to your everlasting gift of love – you wedding video. This little guide that we’ve compiled today will help not only couples give suggestions to their videographers on what background score they want in their wedding album, but also the couples best friends or close relatives who’re planning to create some video memoirs to play during the sangeet ceremony. This hit track from the latest Eid release Sultan, Jag Ghoomeya is perfect to tell your love tale in the most beautiful manner in your wedding video. Another serene number, Bolna from Kapoor & Sons could be the best match for those scenes focussing on the soft-love moments the couples share during this beautiful phase of their life. This song created on the famous TV show Coke Studio has all the ethnic feels perfect to add a traditional touch to any hindu wedding. The emotional lyrics of this song, along with the folk music will truly move you and your audience everytime you watch your wedding video. 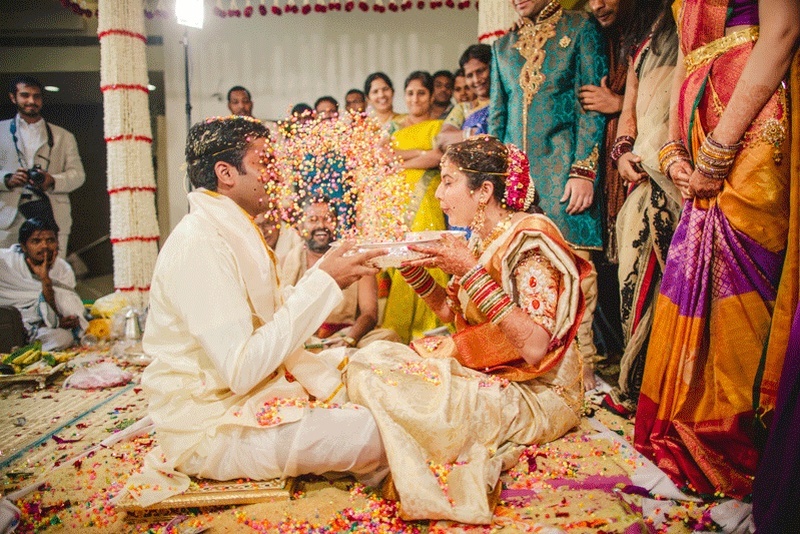 Talking of folk, how can we leave South Indian weddings behind. This upbeat song has the perfect blend of traditional South music remixed with english lyrics making it a fun number for your wedding video. This song from the movie English-Vinglish should be on the mus-have list of Maharashtrian weddings simply for its fun beats and resemblance to the whole shaadi process in a song. By now we've heard many versions of this lovely punjabi song, but this particular take by Jasleen Royal is hands-down a true winner! From a slow pick up to the smooth entrance of desi beats this song will surely uplift your wedding video. Another Punjabi song, but this one a slow track could be well fitted as a teaser wedding video background song or incorporated during the wedding ceremony bit. Can it get any more ironic with this song being from the movie named Happy Ending?! Need we say more?! This classic song has been on every videographers wedding video song list, hence we just couldn't escape this one! Lastly, the movie that got destination weddings back in trend and gave us a whole new book of wedding goals, this wedding video song from Yeh Jawaani Hai Deewani makes the final cut.